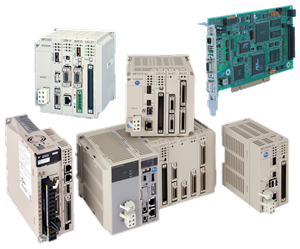 YASKAWA Machine Controllers are based on three essentials, from which ideal Motion Control can be achieved on a wide variety of machines. High speeds in program processing and network communication are essential to maximize the output of intricate machines. The high-speed CPU used in the machine controller shortens the execution time of commands. Also, with the MECHATROLINK motion network used, high-accuracy and high-speed Motion Control on multiple axes is realized. Excellent synchronization of the controller is important in applications that require synchronous control on multiple axes. The machine controller can meet such requirements in various applications and improve machine precision. For high-level control, greater efficiency in programming and maintenance is necessary. The easy-to-use Windows based editing techniques of the MPE720 engineering tool enable efficient creation and editing of ladder programs. To shorten the time required for design and maintenance, the efficiency of the methods used for system settings, program management, and displays has been improved.